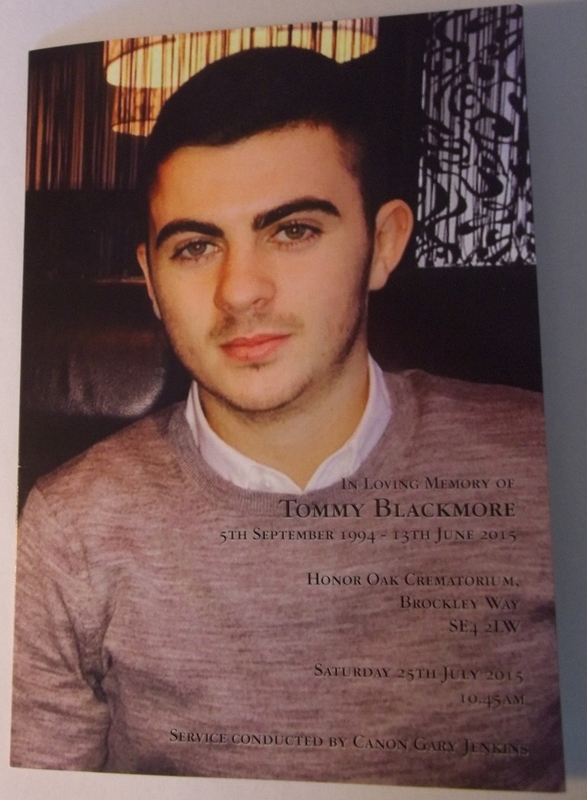 Huge crowds came to Honor Oak Crematorium today to say farewell to Tommy Blackmore, aged 20, who died five weeks ago in tragic circumstances near to Tower Bridge. On the way we stopped at the Blue - Jon from Albins laid a flower in front of the Bermondsey Lion - and at Millwall FC where the club presented the family with a Millwall shirt emblazoned '1. Blackmore'. 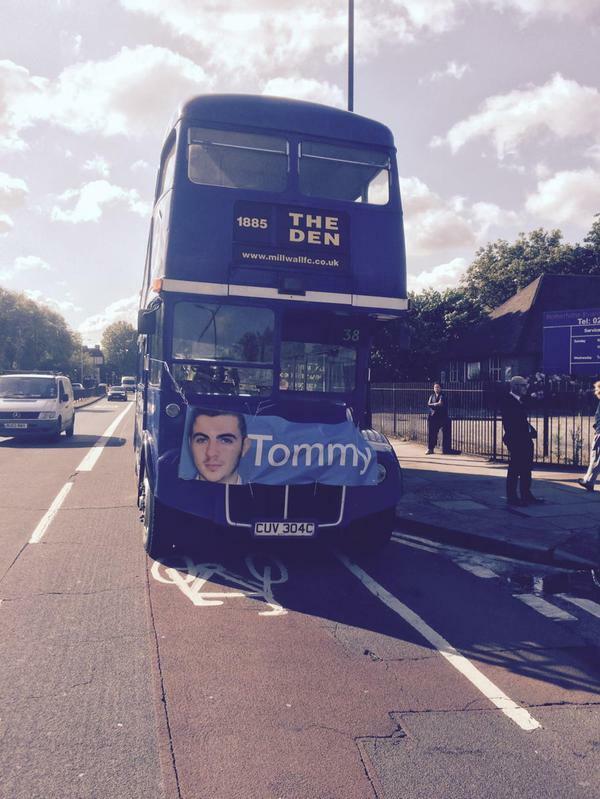 Tommy was a devoted Millwall fan. In the service there were wonderful tributes from family and friends to the 'cheeky chappie' from Rotherhithe, to the loyal friend and devoted son and brother, to the kind hearted fundraiser who had raised over £36,000 for a cancer charity. There was laughter, as well as tears, as the congregation recalled Tommy's love of fashion, his eyebrows ('the most perfect in the world'), his love of Pizza, Nandos and Ketchup. In my sermon I said 'it shouldn't be like this'. Tommy's life shouldn't have ended so early or in the way that it did. 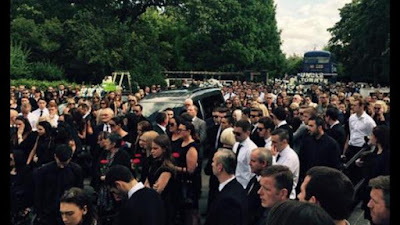 The very number of people who had come today was a testimony to the kind of man he was. May God bring his comfort and peace to all who mourn the loss of Tommy. Only in Bermondsey could a deanery social be such fun. Only in Bermondsey could the singing range from 'Maybe its because I'm a Londoner' to 'Daisy, daisy' and 'I'm enery the eighth I am' to West African spirituals (thank you St Katharine's), to an all singing all dancing praise time with the Area Dean on the tambourine (thanks Wayne for capturing the moment with your tweeted video above). Not to mention JS Bach on the organ from Nick, the most amazing South American salsa dancing from three small children, Adrian's northern monologue and Maria's Betjeman poem..
And thank you to Adrian, our wonderful lay chair, for masterminding the whole evening. You're right: Bermondsey has got talent. It was with great sadness that the congregation learnt of the recent death of the Revd. Ted Roberts, vicar of St James and St Anne's, in the 80s. Ted led a remarkable life of service to the Gospel. A service of thanksgiving for his life will be held at St James on Saturday 26th September at 11.30am. Ted was born in south-east London in November 1928, the younger brother to his sister, Pat. Their mother was a Roman Catholic from Middlesbrough. Their father was a proud cockney of Jewish heritage, who operated street betting schemes on the edge of legality and spent most of the 1930s out of work. They lived on the borders of Peckham and Nunhead where their grandfather ran a succession of pubs, including The Nun’s Head and one in Bird in the Bush Road. The household was very poor, but their parents wanted Pat and Ted ‘to do better’. Ted attended primary School in Peckham but did not enjoy it, partly because of the poverty and partly because the standards instilled by his mother did not seem to gel with the surrounding culture. The war years were spent as a child evacuee in various parts of the country (Devon, Sussex and south Wales) living with a range of families, who displayed differing levels of kindness and hospitality. He passed the 11plus and thus enrolled with Brockley County School, although it was evacuated en masse at various times. Following an unfortunate choice of subjects , he left school at the end of the first year of the 6th form. He often wondered what emotional and psychological legacy this very uncertain, unsettled and anxious time left with him in later years. It certainly made him resilient and perhaps contributed to his reputation for charm (as a survival technique). He entered the advertising industry, joining the firm, which was later to become Oglivy and Mather. He was conscripted for National Service in December 1946 and served in England with the Royal Artillery. He clearly enjoyed this time and was almost promoted to officer class. On discharge in autumn 1948, his commanding officer described him in glowing terms ... ‘a remarkable young man who, provided he maintains his present progress, should have an excellent future in any walk of life.’ He returned to the advertising firm, where he met and fell in love with a young artist, also on the staff. Ted and Audrey were married in August 1951, aged 22. In preparing for their wedding in church, they became friends with the churchwarden, Jack Wallace, a battle scarred infantry captain who had become a Christian. Jack challenged them both that becoming a Christian was more than an assent to doctrine – it involved a total commitment of one’s life to Christ, with the result that one’s whole life was changed. In 1952, Jack invited them to attend a residential weekend where they both decided to commit their lives to Christ. They both served as counsellors at the Billy Graham crusade meetings in Haringay in 1954. By then, Ted had already felt called to the ministry and started training at Oak Hill, while Audrey lived alone during term time in their home in north London. (There were no such thing as married quarters in College in those days and ordinands were expected to live a celibate lifestyle). He was ordained in 1956. His first curacy, which he did not enjoy, was in suburban Edgware. Their eldest daughter Jane was born here. The second curacy was in the mining town of Bedworth, Coventry with Will Maggs. It was here that he formed what was to be a life-long friendship with Snowy & Sybil Davoll and Simon was born. In December 1961, Ted was appointed Vicar of St James the Less, Bethnal Green and St. Mark’s Church, Victoria Park, a position he was to hold for 17 years. During this time, three further children were born – Kate, Peter and Liz (not bad for a couple who had initially been told that they couldn’t have any). Tragedy struck in 1971, when Kate was knocked down by a car outside the Vicarage and suffered multiple injuries, some of which she lives with today. During the 1960s, as the influence of John Stott spread throughout evangelical circles, Ted became increasingly struck by the reality that the Church of England had rarely become established amongst working class communities of England’s cities and Urban Priority Areas and by the conviction that evangelicals needed to rediscover what Jesus meant when He said that ‘the Kingdom of God has come near’ (Mark 1:15) and He had come to bring ‘Good News to the poor’. (Luke 4:18). 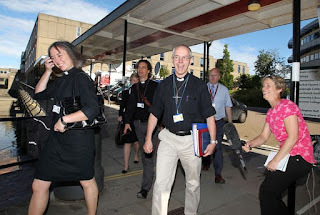 They joined a group of clergy couples led by David & Grace Sheppard at the Mayflower Centre in Canning Town, which also included John and Angela Pearce and Mike & Veronica Whinney. Ted and David were also strongly influenced by a Baptist layman called Roger Dowley, who lived in Bow (and then Walworth) and the founders of the Frontier Youth Trust (FYT), amongst others. From these prayers, studies and discussions came a number of initiatives including the Evangelical Coalition for Urban Mission (ECUM) and the Evangelical Urban Training Project (now UNLOCK). Much of the fruit of this is to be found in the Faith in the City report of 1985. In addition, Ted forged two projects in Bethnal Green, both of which have stood the test of time. 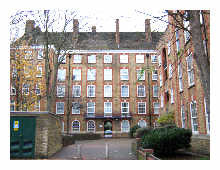 The first involved the demolition and re-development of the church plant at St. Mark’s Victoria Park to provide a new church building and hall, plus 32 flats of rented housing, owned and managed by Victoria Park Housing Association, all as described in his short book Housing & Ministry. The second project was the selection, training, ordination and placement of local, working men all in the context of the two parishes – the so-called ‘Docker Priests’, although, in fact, only one of them was a docker by trade. 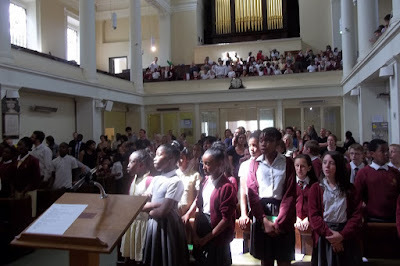 In this project Ted was greatly supported by the visionary leadership of Bishops David Sheppard (of Woolwich) and Trevor Huddleston (of Stepney). Ted wrote about this project in his book ‘Partners and Ministers’. These men were but four of the 17 curates Ted was responsible for in his career, including the first married couple to be ordained deacon together on the same day (Anita and Colin Smith). 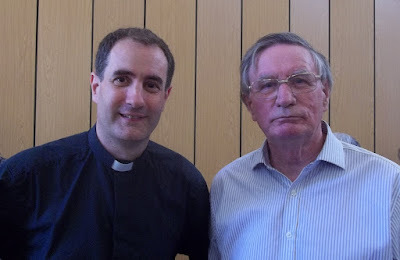 Having served as Area Dean, Ted left Bethnal Green in 1978 to be a Residentiary Canon at Bradford Cathedral, where he was also served as Director of Social Responsibility for the Diocese. This was a short and unfortunately unhappy spell. He left after just 4 years, spending time as Acting Warden of Scargill House, before returning to London as Vicar of St James and St Anne Bermondsey, where he was reunited with Snowy & Sybil Davoll. There he began a long-term programme of refurbishment and re-ordering of St James Church, which continues to this day and, much more excitingly, a second attempt to launch an Ordained Local Ministry Scheme, following on from the clear recommendations in Faith in the City. This time he was supported Bishops Ronnie Bowlby and Peter Hall and also Peter Maurice of Rotherhithe, subsequently Bishop of Taunton. The strategy adopted was to undertake a pioneer scheme in Bermondsey, culminating in an unprecedented ordination service in St James Church on 11th December 1988, with Snowy as one of the candidates. 10 years later, Bill Garlick, a painter and decorator and Stan Catton, a London Transport bus mechanic, were ordained as OLMs, licensed to St James. Ted had already agreed to leave Bermondsey to begin working full time on establishing the Ordained Local Ministry training scheme in Southwark as the Bishop’s Advisor for Urban Ministry, when a second tragedy struck the family in August 1990 – Peter, having suffered from depression for much of his teens and 20s took his own life, aged 26. Peter’s life is commemorated in the communion tables and lecterns at St James Church, which he designed and helped to manufacture. The OLM Scheme, initially called the Local Non Stipendiary Ministry scheme, was launched in Southwark Diocese in 1992, with Stephen Lyon as the first Principal and made a huge impact before it was decided to close it in the mid 2000s. 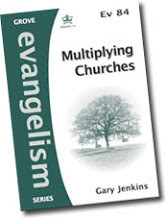 More can be read in ‘Ordained Local Ministry’ by Malcolm Torry and Jeffrey Heskins, published by Canterbury Press in 2006. Ted and Audrey retired to Ipswich in the mid 1990s, to a bungalow which they had been able to buy with the generous loan of two friends. Here they both enjoyed an active life, with Ted much in demand for his services especially St. Margaret’s Ipswich. 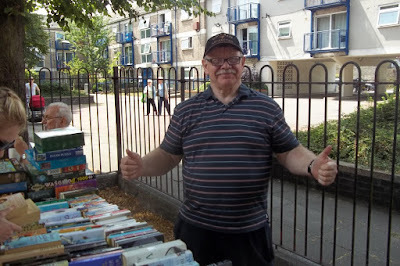 Having survived both prostate cancer and a quadruple bypass operation, I think he felt that he would never leave Ipswich, but in 2013, they were able to sell up, re-pay the loan and move to Morden College in Blackheath, almost back to where life had started. Ted was unwell with various ailments from almost the moment that they arrived, and spent quite a bit of time in the on-site hospital wing. But he entered fully into the life of the College when he could and became much loved in a very short space of time. With kidneys and heart failing, he spent his last 7 months in the sick bay at Cullum Welch Court, where Audrey could visit him each day and his daughters were close by. Simon was able to visit him from Australia just before Christmas 2014. He died in peace on 28 June 2015. Ted Roberts was an exceptional and warm human being and a faithful and inspirational minister of the Good News of Jesus Christ, who lived out that life-changing commitment to Christ in deprived urban/inner city areas for the whole of his life, despite many set-backs. 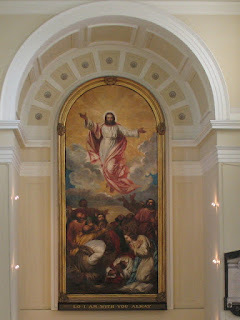 He did much to build up and motivate the members of the churches entrusted to his care and others with whom he engaged. He was charming and witty, yet possessed of clear vision, analytical thinking and steely determination to tackle some big issues that many others have considered and drawn back from. Here is a photo of our latest breakfast for the ladies of St James and St Anne's. The ladies sat down to a full cooked breakfast in the south lounge and then adjourned to hear Despina Francois tell her moving life-story in which God had been powerfully at work. This was the second women's breakfast at St James and this time the organisers had a brainwave: get the men to do the cooking! Friday night and it was our men's night in the upper room at the Angel, with its spectacular views of the river and Tower Bridge. Paul Brown, from City Hope Church in Bermondsey, was our guest speaker. It was the day that his wife completely out of the blue said 'I am going to go to church tomorrow' that started the sceptical and definitely non-believing bricklayer Paul on a journey that led him not only to embrace the Christian faith himself, but becoming a full-time sharer of the good news - which is what he does today. 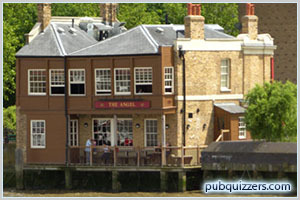 It was a great evening, aided by the excellent food and drink served by the staff at the Angel. Next day the sun was still shining and it was the St Anne's Summer Fair in the church gardens in Thorburn Square. Here's bookstall supremo Ken, part of the St Anne's team who faithfully make the fair possible each summer. He's just sold me three books to read on my summer hols. 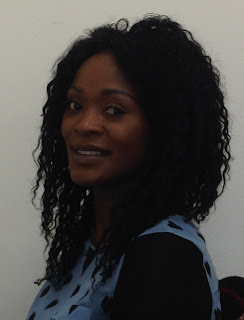 Next day was Sunday, and at St James, there was the chance to hear from Theophilia Shaw from the Centre for Theology and Community who had been at St Anne's the previous week. We had previously heard Theo speak to the deanery synod and we were delighted that she could come to our two churches to speak to us about money management, debt, credit and what the churches can do about these important matters, all in the framework of Christian teaching about money. Theo is a great speaker. She communicated well to our congregation. 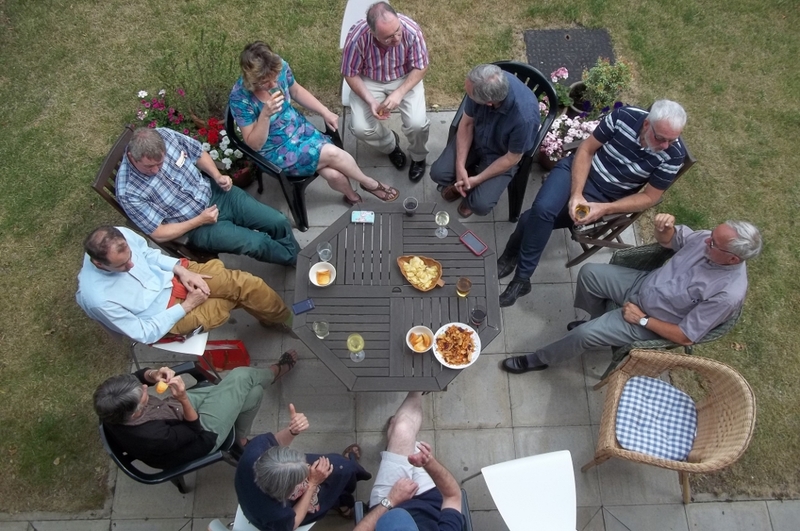 She got people working in small groups for discussion, and, after she has written a report on her Sunday visits, she will be coming back to speak to the two church councils in September. Always a special occasion, our new ringers made it extra special. Their proud parents sat in the churchyard hearing the bells ring, and during the service each of the ringers received a certificate from the Docklands Ringers, and the whole school community watched this video of what of what had been going on in the bell tower before the service. Then, before the leavers had a farewell picnic and there was much signing of shirts etc and quite a few tears, our Chair of Governors, Sir Simon Hughes presented prizes including a copy of the Gospel to each leaver. Simon does this every year but this was the first time the children received their farewell gift from a knight of the realm (warm applause from the whole school for Simon's well-deserved honour from the Queen). Simon told the children that he had been invited (and declined) to appear on 'I'm a celebrity, get me out of here' but there was something better that being a celebrity and that was to know that God loved you. He pointed them to St James's large painting of the Ascension with its text 'Lo, I am with you always' and told the leavers that they could know that God would be with them always, wherever they went. It was a great end to a great service. Thank you to Sir Simon, to all the teachers and staff, and to everyone that makes St James's School the wonderful place that it is. Have a good holiday everyone. This month's edition of the Southwark diocesan newspaper, The Bridge, has an article entitled 'Bermondsey remembers' about Barry Albin-Dyer's funeral. Over the last weekend I have been in York where the Church of England's 'parliament', General Synod, has been meeting at the University. 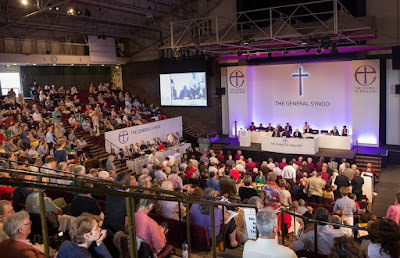 Synod elections take place every five years and this was the last meeting of the old synod. Now we must all stand for re-election over the summer before the Queen opens the next General Synod in November. 1. The Archbishop of York's presidential address: a wonderful bible saturated address on day one of the synod. Profoundly moving and thoughtful. 2. The debate on additional texts for baptism. It sounds boring but its good news for Bermondsey with a much more user-friendly service now available for baptism families. Also I got to speak in the debate. 3. Evening worship led by St Michael-le-Belfrey Church, York, on the last evening of synod - loud, celebratory, wonderful. Thirty years ago as a student I attended St Mike's most Sunday evenings. Its great to see they're still buzzing with life. Synod loved them. 4. The Archbishop's Task Force on Evangelism. This was an inspirational fringe event presided over by the Archbishop of Canterbury, focussing on the task of sharing the message of God's love for the nation. For me, it was a real synod highlight, especially when the Archbishop led us in prayer for revival in the nation. We are so fortunate to have Justin as our leader at this time. 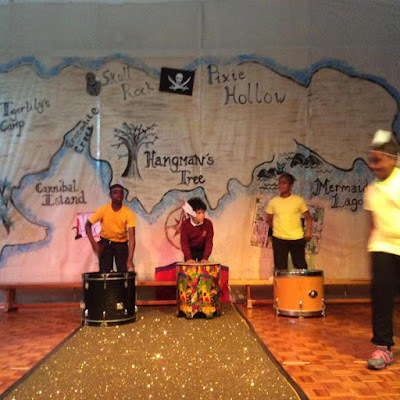 It's that time of year again and there have been two great end of term productions at St James's School. 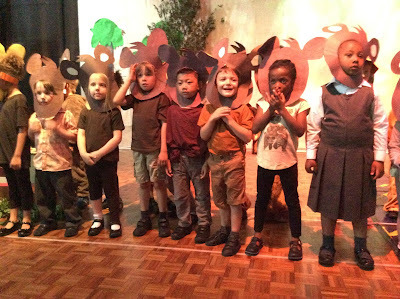 Last week it was the turn of the younger children (left) with Key Stage One's, Into the Woods. Today it was the turn of Key Stage Two with Peter Pan (below). Well done to everyone who took part for two excellent productions - and a huge thank you to all the teachers who made it possible. 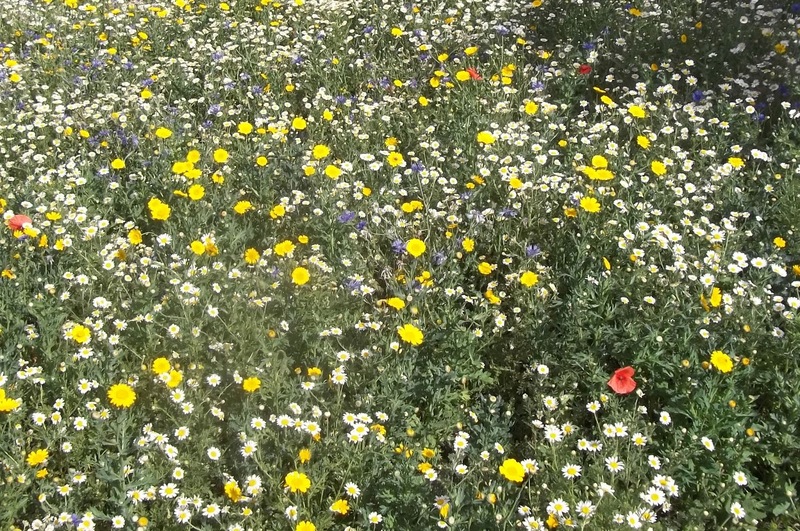 The sun is shining and the newly-planted wildflower meadows in St James's Churchyard are blooming. The new planting is good for the environment and it wonderfully demonstrates the beauty of God's creation. 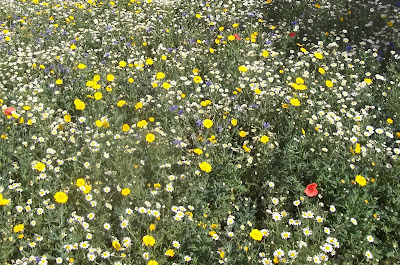 Thank you Southwark Council Parks Department and the team of conservation volunteers that made all this possible. Here is our curate, Jos - ordained priest today - alongside his dad, retired vicar, Stewart. Jos joined us at St James and St Anne's last July straight from theological college in Cambridge after having been ordained deacon in Southwark Cathedral. A year on, having successfully completed his first year in the diaconate, Jos was ordained as priest or presbyter today. Now he can preside at Holy Communion - as he will do for the first time at St James tomorrow and at St Anne's next week - and in due course, when he has completed his curacy, he will be able to take on the full responsibility of being a vicar. Congratulations, Jos, and may God bless you in this latest stage of your service for him.